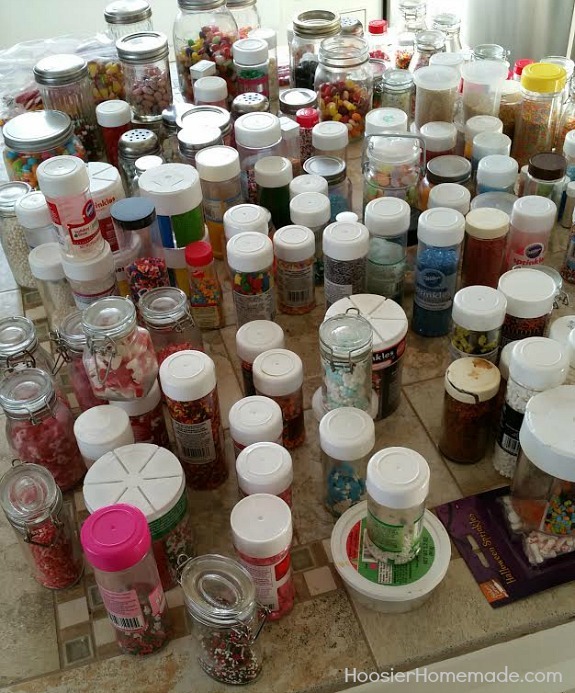 I have a little confession to make – I’m a sprinkles hoarder! I kind of knew that I had a lot of sprinkles, but honestly, I thought it was kind of normal considering the amount of baking, especially cupcakes, that I do. Because – a girl can never have enough sprinkles, right? But after posting a before photo of all my sprinkles on Instagram, I came to understand, that I might have a Sprinkle problem. So what’s a girl to do with all those sprinkles? Well – organize them of course. 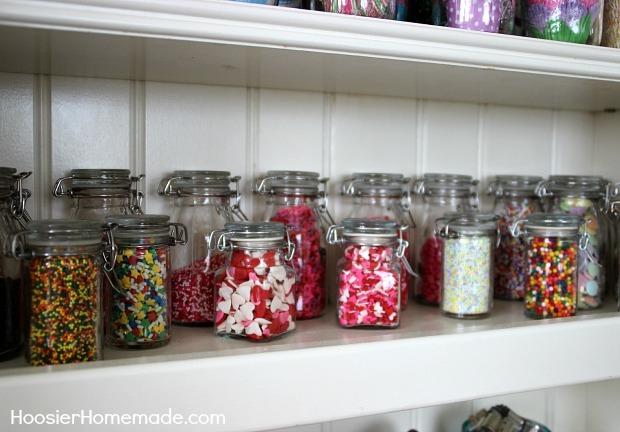 A few years back I began putting my sprinkles, candy and cupcake liners in jars. But over the last year or so, the cabinet had gotten out of control. This finished – beautifully organized baking cupboard didn’t always look this way. 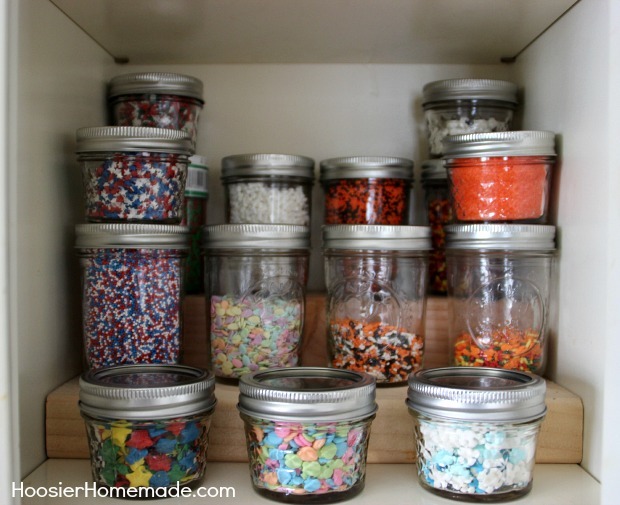 Let’s start at the begin and I will show you how to organize your sprinkles – or candy – or cupcake liners. 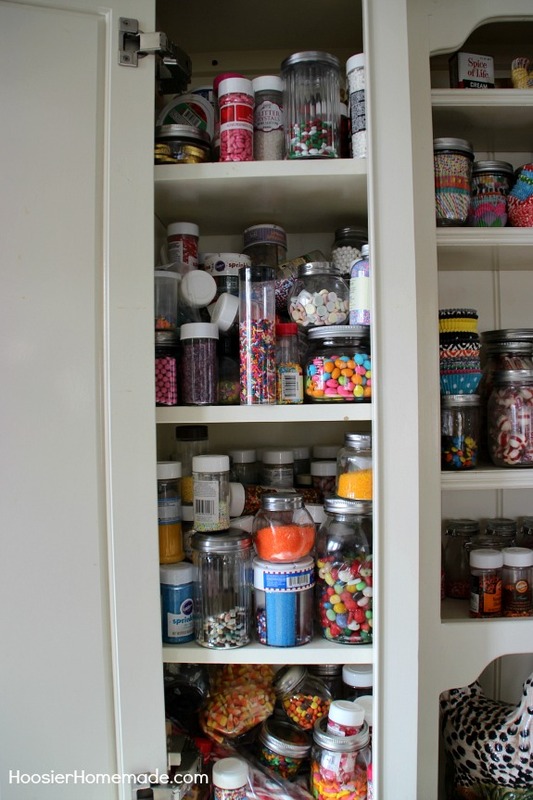 While I had some of the sprinkles already organized, the left side of the cupboard had gotten WAY out of control. I really had no idea what kind of sprinkles I had, so when I saw some fun colors or shapes, I bought them. And it quickly became a bit crazy. The first thing I did was to pull everything out of the cabinet and separate them by holiday, colors and types. Then it was time to tackle the inside of the cabinet. Last year when we were Organizing Spices, Doug made these simple risers that fit on each of the shelves. They aren’t fancy, and honestly, we didn’t even paint them. All of the baking supplies on the shelves covered up the wood, and they are more for function than looks. He measured the interior of the cabinet then cut each piece of wood 1/4 inch shorter than the width of the interior of the cabinet so it would easily fit. The top piece of wood is a 4 x 4. He cut a 45 degree angle off one end to make it fit easier in the cabinet. 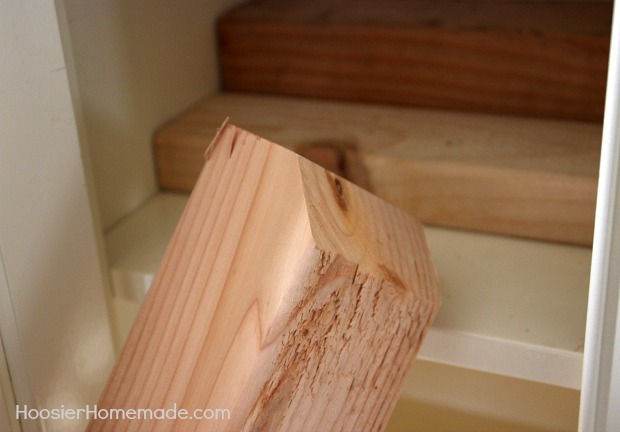 Then the second piece of wood is a 2 x 4 and is cut again 1/4 inch shorter than the width of the cabinet. 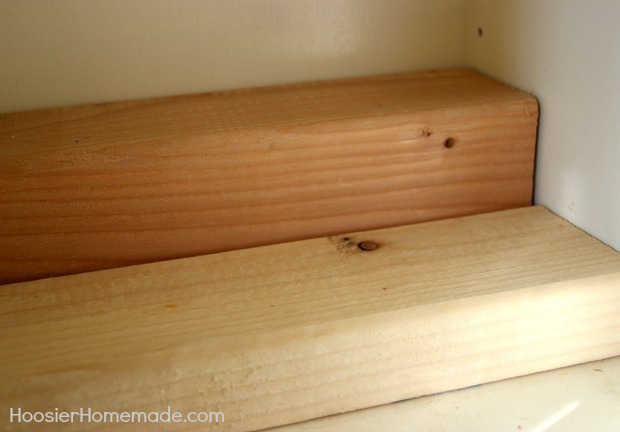 These wood risers make it easier to see the sprinkles in the back, and it keeps everything within the kitchen cupboard organized. After the risers and shelves were ready it was time to tackle the sprinkles. I started by combining the sprinkles that were the same, and then any that were not good to keep I threw out. I did end up with about 20 bottles that were either duplicates or partially full that I have ready to donate. Then the tough decision of what type of bottle or container to use. Honestly, my OCD self really wanted to have the bottles in the cabinet completely matching, but when I started searching for bottles I was shocked to see that most were around $1 each. And since I had well over 50 different sprinkles, I just couldn’t justify spending that much money just so everything was matching. So I compromised, I kept the bottles I had, used some of the small Mason Jars that I had, then bought a couple more boxes of Mason Jars. The Mason Jars ended up being about $.70 cents each. Each of the shelves have a different theme, this one I put all the holiday sprinkles together. 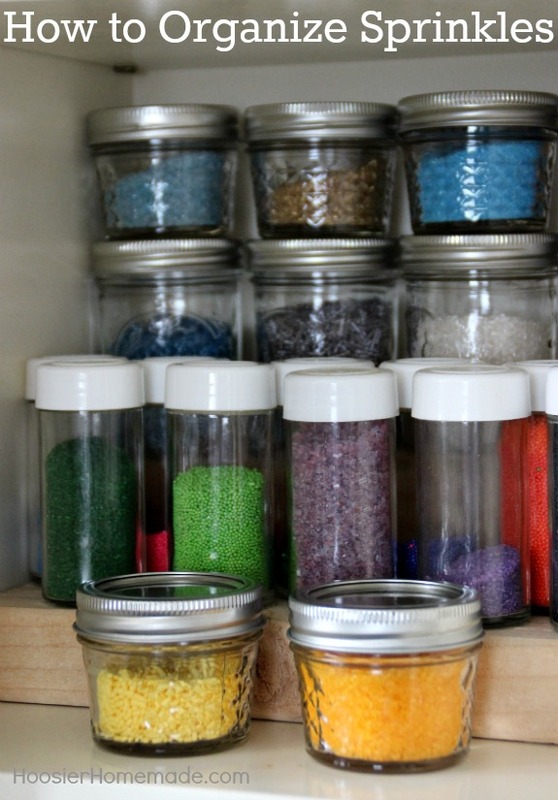 And there is one for the solid colored sprinkles and sugars, one of multi-colored sprinkles and the top shelf has candy that I often use to decorate cupcakes. After the side shelves were done, it was time to tackle the middle shelves. I have had these jars for a few years now. You may remember seeing them in our Cupcake Boot Camp videos. When I first added the sprinkles to jars, it was my intention to not only have them displayed to look pretty, but also be functional. I’m happy to report, they have worked out beautifully. 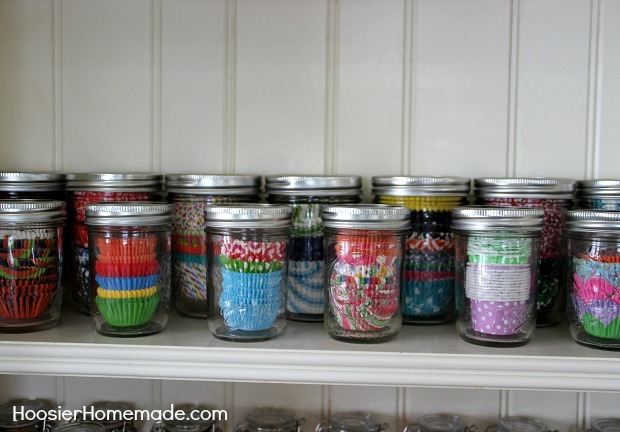 All of these jars are from Hobby Lobby, but you can find them at several craft and department stores as well. They can get expensive if you have a lot to buy (like I did) so I waited for them to go on sale to grab them. Hobby Lobby often has their glass containers at 50% off, making most of the jars only $1. To make filling the jars easy, my tip is to use a funnel. If you – by chance have a child that put away your funnel and can’t find it – not saying that happened to me or anything, use a plastic decorator bag (the same kind you use to decorate cupcakes). 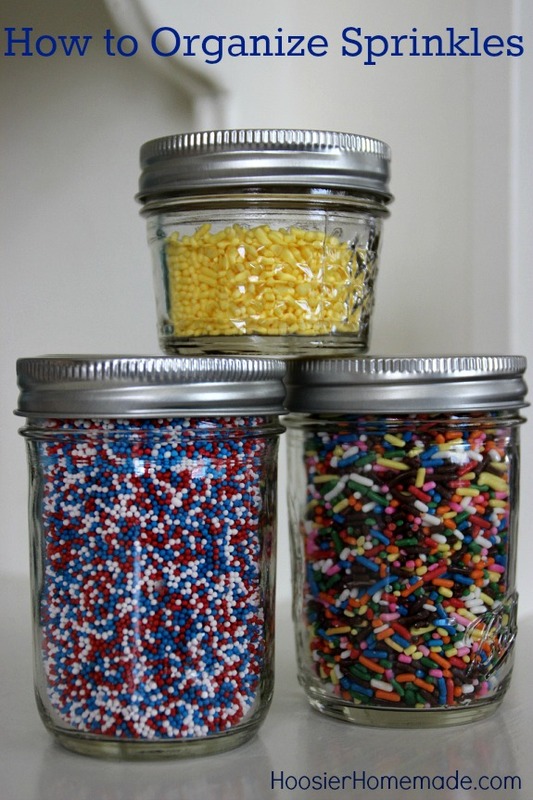 Simply snip off the end, stick it in the jar and fill with sprinkles. The mess is all contained in the bag. After the sprinkles were all done, then I added the cupcake liners to Mason Jars. I have been using this method for a few years now and it’s works perfectly. The jars help the liners hold their shape and it’s great to be able to see the different liners. For mini liners, I used the 8 ounce size Mason Jar. And for regular size liners, I used a wide mouth pint Mason Jar. 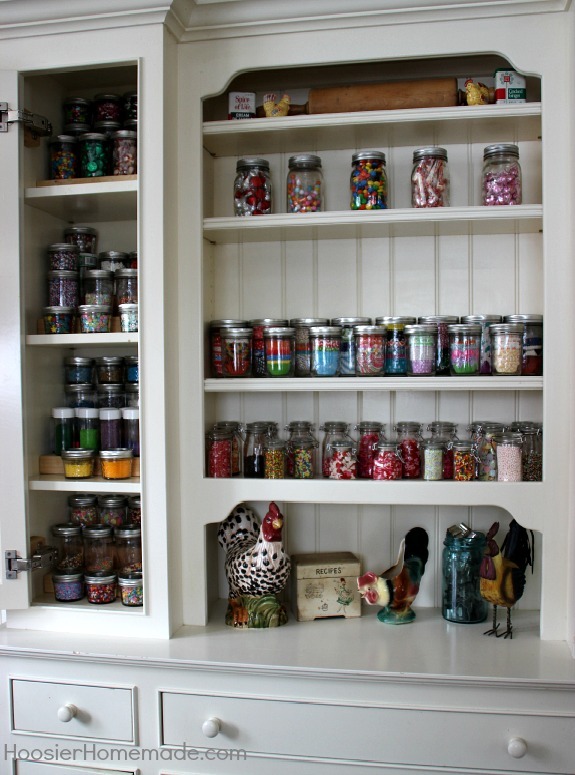 The jars filled with candy line the top shelf. They are also pretty, but functional. Now it’s time to tackle the baking supplies area. 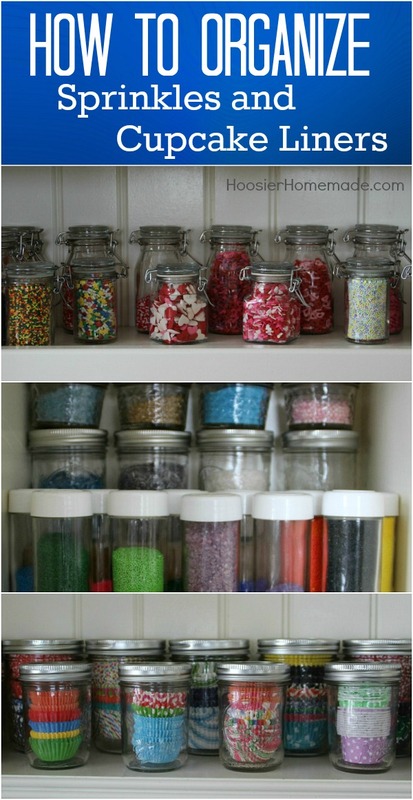 You have an impressive collection of sprinkles, and it looks beautiful all organized into jars! Thanks for linking up with Merry Monday this week! I love this. I have a cabinet EXACTLY like your before pic and in my pantry and it’s out of control. I would love to do this, but I’m afraid they’ll get bleached by the sunlight. Has anyone had this happen? Hi Stephanie, my sprinkles have been in jars on the shelf for a couple years, at least, and I have not had any trouble. Although, I don’t have direct sun shining on them, I do have sun in the kitchen. I’m envious of your sprinkle collection! I thought I had a lot! I love how you are beautifully displaying all of them! So glad you like them, it’s definitely much easier this way. Thanks for stopping by! I’m glad I’m not the only one with a sprinkle obsession. never though about using mason jars for my cupcake liners. So so so pretty..looks like art work..love all the bright colors and wish I had space for this as I have a gallery kitchen..small bungalow. Oh.my.gosh!! This is such a helpful and brilliant idea! I got up immediately and went after my baking cupboard to implement it! What fun and it looks great and makes me feel like I’ve really accomplished something! Thanks!! So glad you like it Anita! That’s awesome that you were able to get your cupboard organized! I’d love to see pictures, feel free to share on our Facebook page or email me! Holy cow! That’s a lot of sprinkles! 🙂 I’m all about organizing and de-cluttering right now, so I appreciate any tips I can get. Looks wonderful- ok cabinet here I come! Thanks so much Mary! I’d love to see your cabinet when you are done! Feel free to share a picture on our Facebook page or email me! Thanks so much for stopping by Kim! I couldn’t believe how helpful putting the liners in jars was until I did it. I’m a sprinkles hoarder too! Love this idea and can’t wait to put it to use. Thank you! So excited you like Maria! Sprinkles hoarders need to stick together! ha! Thanks for stopping by! How do I tell if the sprinkles have gone bad? Hi Helen, most of the time sprinkles don’t go bad. But they do dry out and clump together, those are the ones I threw out. Love this Liz!! 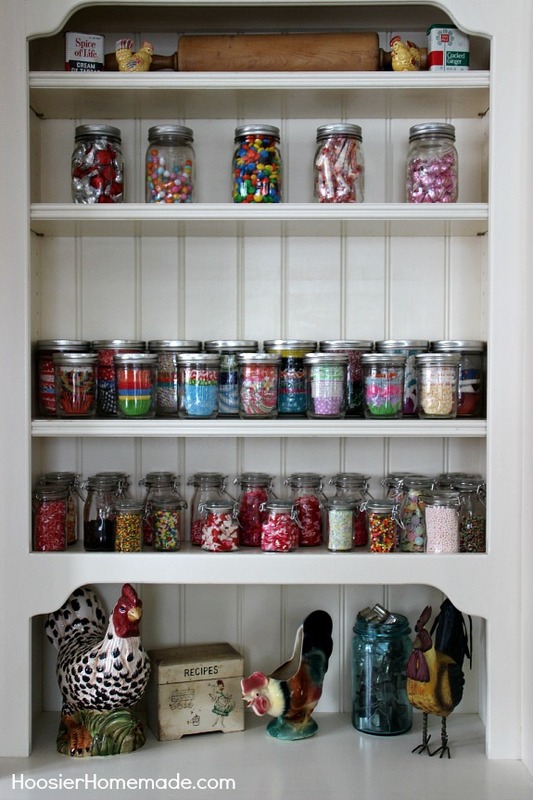 Now I just need to clean out cabinets to make space for my sprinkles and stock up on glass jars!!! I have them stacked on an old plate rack and it was pretty when I had 20 bottles… now I have probably 100+. and it’s a disaster! Oh I bet you have a ton of sprinkles, Rose! Finding the space is definitely the key.